"When the Son of Man comes in his glory,and all the angels with him,he will sit upon his glorious throne,and all the nations will be assembled before him. And he will separate them one from another,as a shepherd separates the sheep from the goats. He will place the sheep on his right and the goats on his left. Then the king will say to those on his right,'Come, you who are blessed by my Father. Inherit the kingdom prepared for you from the foundation of the world. For I was hungry and you gave me food,I was thirsty and you gave me drink,a stranger and you welcomed me,naked and you clothed me,ill and you cared for me,in prison and you visited me. 'Then the righteous will answer him and say,'Lord, when did we see you hungry and feed you,or thirsty and give you drink? When did we see you a stranger and welcome you,or naked and clothe you? When did we see you ill or in prison, and visit you? 'And the king will say to them in reply,'Amen, I say to you, whatever you didfor one of the least brothers of mine, you did for me. 'Then he will say to those on his left,'Depart from me, you accursed,into the eternal fire prepared for the devil and his angels.For I was hungry and you gave me no food,I was thirsty and you gave me no drink,a stranger and you gave me no welcome,naked and you gave me no clothing,ill and in prison, and you did not care for me. 'Then they will answer and say,'Lord, when did we see you hungry or thirstyor a stranger or naked or ill or in prison,and not minister to your needs? 'He will answer them, 'Amen, I say to you,what you did not do for one of these least ones,you did not do for me. 'And these will go off to eternal punishment,but the righteous to eternal life." To speak the truth -- to accept and to live what we know in our hearts is morally right and ethically justified in God's sight -- is to follow Christ. Feeding the physically hungry and the spiritually hungry; quenching physical and spiritual thirst; accepting and including strangers and outcasts; to not put ourselves first, but always put others ahead of ourselves. This is following Our Lord Jesus. Even when it makes us unpopular. Living according to His Way, following Him even when He is walking on His Way to the Cross. It requires guts. Then, consider yourself very fortunate, or consider yourself cowardly or ashamed to be known and publicly identifiable as a committed follower of Christ and His Holy Catholic Church. ... Demanded of those who would pledge their allegiance -- their loyalty and devotion -- to Christ. Demanded from those who would follow the example of Christ, our Crucified King! Today, on this final Sunday of the Church's Liturgical Year, Our Lord Jesus, Our King, is issuing a challenge to us — to prove to Him that we fully accept, and proclaim, and live the truths He has taught us in His Gospel.Today, we are being challenged to continue proclaiming or to start proclaiming the truth about God’s unwavering love for all men and women. Today we are being challenged to prove that we trust and live the truth about the never-failing promise that good will triumph over evil, that light will destroy the darkness. 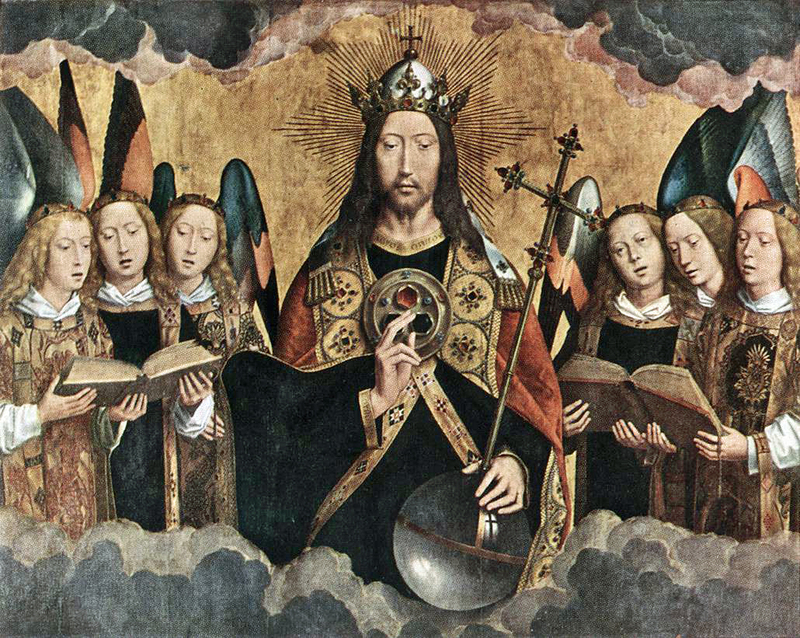 This Feast of Christ The King challenges us to fully accept and proclaim the truth about the moral teachings of our Catholic Faith -- teachings which have remained rock-solid and relevant and true -- long after trendy fads and self-indulgences proved to be nothing but evil and empty lies. It takes guts and loyalty and trust to follow Christ our King.And, yes, it IS demanding and it IS difficult. But it is NOT impossible, as the thousands of Saints have proven over 2000 years! Following our Crucified and Risen King is the only path that leads us beyond our times and our world ... to live forever in the timeless, infinite vision of the glory of God in Heaven! We all SAY that we want that -- that we want to enter Heaven and eternal joy. But, do we have the guts to follow Him? "He will place the sheep on his right and the goats on his left. Then the king will say to those on his right,'Come, you who are blessed by my Father. Inherit the kingdom prepared for you from the foundation of the world.'" Do YOU have the guts to prove how much you desire to be with Him in Heaven?